The Texas Rangers have found their swagger at home in Game 3 of the World Series last evening in Arlington. 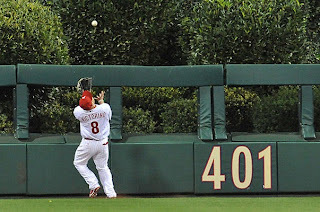 The Rangers looked as if they had caught the same case of the sleepies that the Phillies had against the Giants in the NLCS. The Giants on the other hand couldn’t get started in Game 3, they had a chance to put this series in a serious advantage for them with a win in this game. It was not to be. Game 3 is on tonight at 8PM Eastern, from Texas again. The Rangers can really make a series of it tonight if they can win again. It's Halloween so who know's what lies in store for the Giants who by the way wear the 'orange and black' - Halloween colors! I say 'for now' because of the ongoing negotiations with Werth's agent and the mentioning that J.C. Romero could be brought back at a reduced rate, but for now these players appear likely to not return to the team in 2011. The Giants are a team on a roll. Since the World Series started, they have rolled out two high scoring games and have snared a 2-0 lead in the World Series. The combined run totals of the first two games have landed this Giants team into 7th place all-time on the highest run totals of the first two games in the World Series. The Giants blanked the Rangers 9-0 in Game 2, the Rangers rusty performances is not what most people expected from them, the team was off a long time waiting to see who they would play in the World Series. The long off time may be the reason that we've seen a different Rangers team than we did in the ALCS. New heroes are emerging from this World Series. Edgar Renteria is one of them. Freddie Sanchez is another. It's kind of refreshing to see some new names getting some of the glory, if the Phillies can't be in this of course. 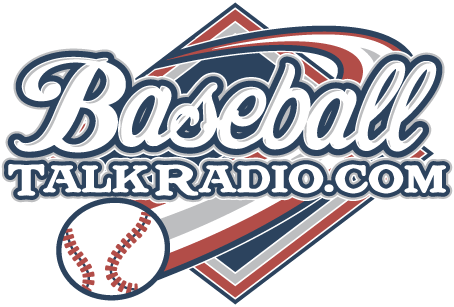 The World Series picks back up on Saturday night at 6:30 PM Eastern from Texas for Game 3. Game 4 is scheduled for an 8pm start Eastern on Sunday. The World Series is of Fox on TV. 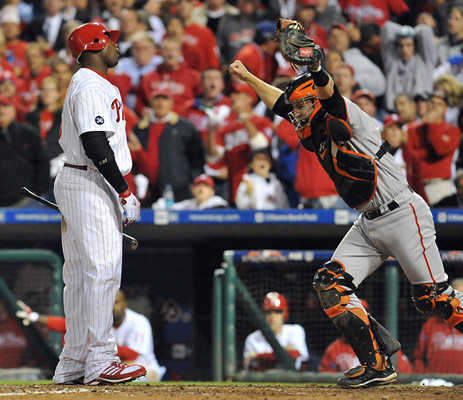 We learned a couple of things when the Phillies played the Giants in the NLCS. This is a tough Giants team, and they don't appear to be backing down to the Rangers now that they are in the World Series. 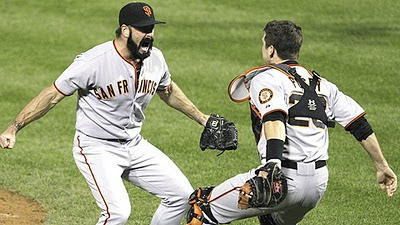 The Giants won Game 1 of the World Series last night in convincing fashion 11-7. The mystic that Cliff Lee is invincible is starting to erode just a bit as he got hit around last night. Maybe it was Lee's hat that had him off kilter last night. It was one of the dirtiest hats I've ever seen a ballplayer wear. I am surprised he gets away with that, it's almost a disrespect to the colors of the team with some much dust and dirt built up, you can't even see the real color of the hat. I thought about the Phillies during Game 1 of the World Series. I remembered the terrible offensive funk that the whole team fell into during the NLCS, when they could practically not get on base, and when they did they could not score any runners. Yes, Phillies pitchers did keep those games close, but it was a lasting memory for me how the offense just was deflated on every level. Days after the NLCS loss we learned of the horror of the Phillies plane when it returned from San Francisco and was involved in a 'near miss' upon landing in Philadelphia. That story in itself was scary, baseball aside. In case you missed it, read about the story here. Call it what you will. Jayson Werth announced that he may again be a Phillies player next year. Ruben Amaro is quoted in the press as saying that the Phillies can afford Werth who is at the end of a four year contract with the Phillies and is currently soliciting offers from other teams. Jayson contracted the services of the most controversial but successful agents in baseball, Scott Boras. He is known as a tough negotiator and a guy that gets the most for his player, even if it’s not in his best own interest to go to a team. A lot of mixed stories appeared in the press just after the Phillies run in the playoffs was over. One of them is the one mentioned above, that Jayson Werth may actually return to the Phils. He will make a lot more than he did the last two years if he does. When Jayson originally signed with the Phillies, he was a journeyman in search of a home. A kind of ‘Cody Ross’ type player who’s name was known but hadn’t yet achieved that superstar status of coveted ‘free agent’. That has all changed for Werth now, as he has strung together a couple of nice seasons to be measured by. Werth may be eyeing the kind of contract that Boras got for Matt Holiday, a really huge $120 million for seven years in St. Louis. I don’t think Werth is going to garner that attention. He has said himself, he ‘wants to take things slow.’ Read that as meaning that he wants to consider all comers and then sit back and see what benefits him most. The Phillies could cast out an offer, but that offer won’t last forever. If such an offer is rebuked, the Phillies want to know who they are putting out in right field as soon as possible for 2011. This story about Werth will be told again and again in the press, and rumor central. 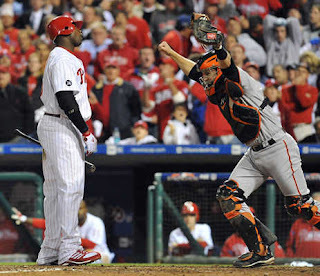 The only time we really will know if Werth is coming back to Philly will be the day that such a contract is announced. Until then, it’s Werth Mania taking over in the free agency market. 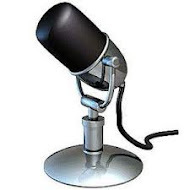 Will some big players approach Boras with some cash? Will Werth be as successful when he goes away from the Phillies? We can only sit back and see what happens. The images will play back over and over in our minds, but if we forget them a little, here's some of the photos from Game 6 of the NLCS, heartbreaking loss by the Phillies. Thanks to MyPHL17 for the photos! 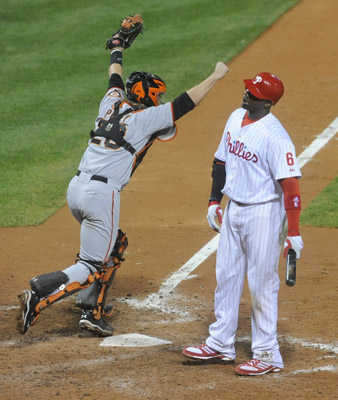 It had to be Ryan Howard to make the last out for 2010, but it wasn't just him that couldn't win this series. The HR by Uribe, did that fan reach over the rail for that ball? Yes, these images will be in the minds of Phillies fans all winter. There is a team that is going to win and a team that is going to lose though. This year, the Phillies peaked in September. October was another story for them. Next season is feeling like it's years away, but it isn't. 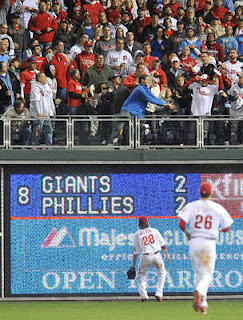 Come Spring of 2011, we'll be back to see them, the Phillies faithful, another run, another season. It's memories like these you don't forget, the happy, and the sad. There's no crying in baseball, there's no crying in baseball. The headline was attractive. "Destiny Awaits Tonight In Philadelphia" but for who? Will it be the Phillies who must win again to stay alive in this NLCS and force an even more important and rare Game 7 for the Fightins? Will this be destiny for the Giants? A team that has been a bit under the radar in the last few seasons, but if you've been reading this blog for some time, you would have read that they were one of my top picks of the previous two seasons and this season. 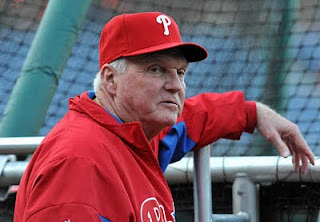 If the Phillies are going to win tonight, they are going to have to pull together and get some offense going. Several key players on this team have underperformed. 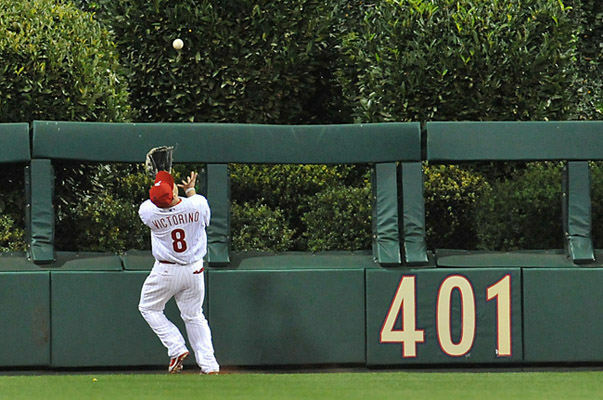 Chase Utley, Ryan Howard, and Shane Victorino are the players who must start playing better tonight in the clutch. 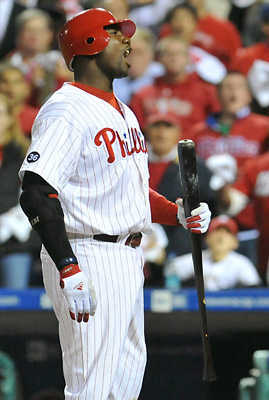 Looking at the Phillies offensive production in this NLCS, it is apparent that the 'funk' is back. This funk is happening to the Phillies at the worst possible time. It is time to shake off the bad games and have a break out game tonight. Victorino, Utley, and Ibanez need to have better at bats and come through in the clutch for this team. Ryan Howard has been on base a few times in the series, but he hasn't produced runs when he has needed to. It's not because these players don't want to produce, it's just that 'stuff happens'. Call it Murphy's Law or call it what you will.